Here is a complete guide about to-do list. You can learn its definition, categories, importance and how to make it easily. As its name implies, the to-do list is a list showing the things you need to do or a list of actions to take. It is often used to design the schedule for a certain day. To be more useful, the to-do list may include these contents: things one need to do, things one want to do, things one should do and others. Here is an editable and printable example. Click the picture to download it. Click here to learn steps to make such a sightly list. It serves as a reminder of tasks to be accomplished. When people are busy, they tend to forget things, which is unavoidable sometimes for people's limited energy. By keeping a to-do List, one makes sure that his tasks are written down all in one obvious place so he doesn't forget anything important. And by prioritizing tasks, planning the order in which one will do them, he can tell what needs immediate attention, and what can be dealt with later. The to-do list is also regarded as the key to efficiency. Knowing what you have to do and the deadlines urge you get things done quickly so that you can finish tasks on time. Making a to-do list is akin to exercising for health. The particular form needed depends on your purpose. The simplest to-do list might be merely a jotting down of tasks in random order, on a scrap of paper. More complex to-do lists can be divided according to their structure into: list structured in chronological order, in order of importance, and by level of specificity. There are a wide range of ways to list your things to do. 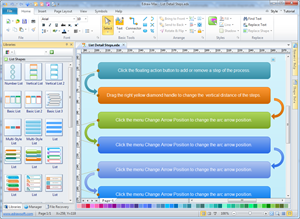 With Edraw, you can make it through mind map, list diagram, task status table, calendar or other templates. Edraw includes lots of built-in list shapes for designers to use, through which you can easily create commonly used list, block list, picture list and table list diagrams. You just need to simply drag and drop the pre-made shapes, no professional drawing skills required. With its intuitive interface, easy-to-use drawing tools, Edraw manages to provide you with solutions that meets any requirements of diagram designing. A to-do list template is ready to use. Click the hyperlinked picture to download it; make some modifications and print it. 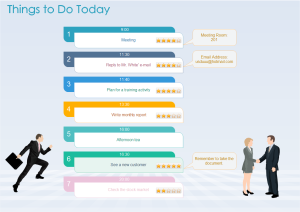 Drawing such a neat and catchy to-do list takes less than 10 minutes using Edraw. Plan your daily schedule using this customizable calendar plan template. It can be used many times by changing date by only one click on the smart button. Click the right picture to download its editable and printable version. 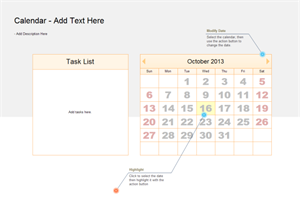 See how it is achieved in Calendar Software with Time Schedule. 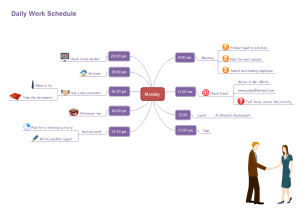 A daily work schedule brainstorming template is provided to facilitate your to-do list creation. You to-do list becomes more visualized with the symbols added. Learn the easy way to make such a ma in the article How to Create a Mind Map.